It is no overstatement to say that the death of Jesus Christ stands as the single greatest moment in all human history. On that dark, dreary day outside the city walls of Jerusalem, events of historical, even cosmic proportions were taking place. Not only did these developments contribute to the turning of the western world’s calendar from B.C. to A.D., but, for the Christian Church, they constituted the central event that captures and demonstrates the mercy and grace of God toward us sinners: Jesus Christ, the righteous God-Man, dying in innocence on a cross, atoning for the sins of the world, reconciling us to God. The doctrine of justification—rightly identified by the Reformers as the central doctrine of the Scriptures—finds its source in this atoning and substitutionary death of Jesus on the cross on Good Friday. Only Christ could accomplish and deliver this justification to us. The Gospel writers also record a series of more immediate and localized effects at the time of Jesus’ death on the cross. These incidents include earthquakes (Matthew 27:51), the raising of people who were dead (Matthew 27:52-53), and—important to this article—the rending, or splitting in two, of the Temple curtain (Matthew 27:51; Mark 15:38; Luke 23:45). As remarkable as the first two happenings were, it’s this last event—the splitting of the Temple curtain that separated off the central, most holy space in the Temple—that is of enduring importance to us. The architecture of the Temple was an intricate and glorious sight to behold. Its most primitive expression is in Moses’ “tent of meeting” (Exodus 27–31). The tent of meeting was a gathering place for anyone who had need of “inquiring of the Lord” (Exodus 33:7). Moses tells us in the book of Exodus that when he entered the tent, the Lord “would speak to [him] face to face, as one speaks to a friend” (Exodus 33:11). Through Moses, God gave instructions for incorporating this tent of meeting into a larger, portable Tabernacle which would accompany the people of Israel through their wilderness wanderings toward the Promised Land (Exodus 25–27; 30–31; 33:7-11; 35–40). The expressed purpose given the Tabernacle was to be a dwelling place for God through which he could meet with and speak to the Israelites. This place, the Lord added, “will be consecrated by my glory” (Exodus 29:42-43). Once the people of Israel were settled in the land of Canaan, they eventually upgraded their Tabernacle to a permanent and more fitting structure called the Temple. In the prayer of dedication for this building, King Solomon reiterated an understanding of the essential function of this space. He prayed to God saying, “May your eyes be open toward this temple night and day, this place of which you said, ‘My Name shall be there,’ so that you will hear the prayer your servant prays toward this place. Hear the supplication of your servant and of your people Israel when they pray toward this place. Hear from heaven, your dwelling place, and when you hear, forgive” (1 Kings 8:29-30). 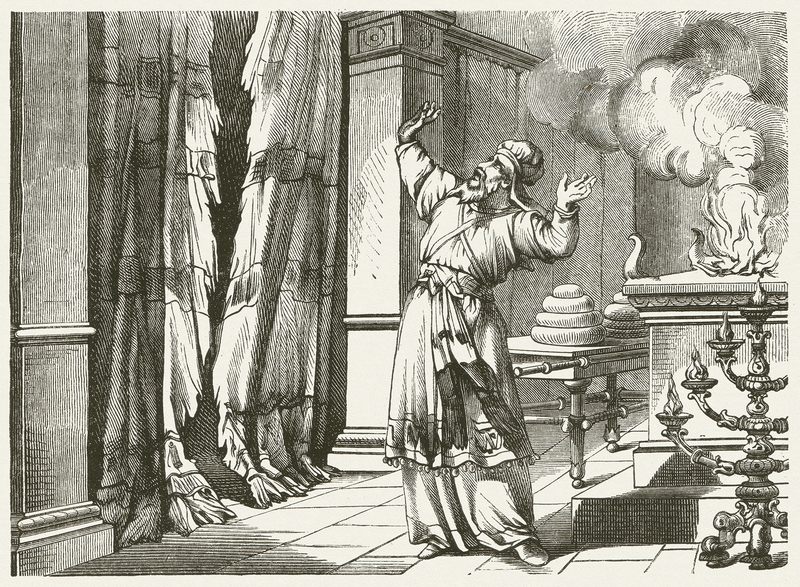 The term “Holy of Holies” (also called the “Most Holy Place”) is first used in Exodus 26:33, where a distinction is made between it and a space just outside of it called the “Holy Place.” Separating these two spaces was a veil or curtain. The importance of this curtain cannot be overstated. Its proper placement had life and death consequences, for no one could enter the Holy of Holies—the place where God dwelt upon the mercy seat, which was situated above the ark of the covenant and between the wings of the cherubim (Exodus 25:17-22; 1 Kings 6:19-28; 8:6-9)—except the high priest, and only once a year (see Leviticus 16). To break this commandment brought certain death (Exodus 33:20). Jump ahead 1,000 years to Good Friday. The Gospel writers record that at Jesus’ death “the curtain of the temple was torn in two from top to bottom” (Matthew 27:51; Mark 15:38). What did this mean? It meant that because of what Jesus accomplished at the cross, access to God’s presence was not limited to one human person (the high priest) or to one day of the year (the Day of Atonement, Leviticus 16). Access was now granted to all who would come believing that Christ’s death on the cross was sufficient for them, and thus that Jesus was their only hope of justification before God. The physical, dividing curtain between God and humanity was opened wide. And, in the powerful words of Hebrews 10:19-20, all are now invited “to enter the Most Holy Place by the blood of Jesus, by a new and living way opened for us through the curtain, that is, his body” (emphasis added). On account of Christ alone we are given the gracious invitation to “draw near to God with a sincere heart and with the full assurance that faith brings, having our hearts sprinkled to cleanse us from a guilty conscience and having our bodies washed with pure water” (Hebrews 10:22). 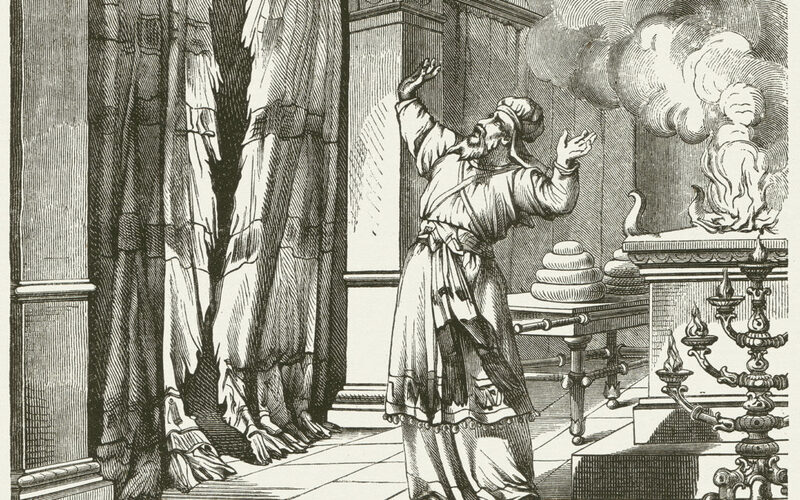 I’ve often wondered what kind of terror came upon the immediate Jewish religious community when the Temple veil was split open. We’re not told of this in the New Testament. But they must have repaired it. For, as Paul says, this people was still under the veil (2 Corinthians 3:12-16). But this is not the case for us! Through Christ, and on the basis of his blood shed on the cross, the veil separating us from God’s presence has been done away with. Through faith in Christ and his atoning death, you and I are given the gift of reconciliation with God and access to him for any and all of our needs. Now, through Christ alone, God’s desire for his relationship with us is made even more glorious and beautiful than we could ever imagine: “I will be their God and they will be my people” (Genesis 17:8; Jeremiah 24:7; 31:33; Ezekiel 37:23; cf. Psalm 73:28; Revelation 21:3). Rev. 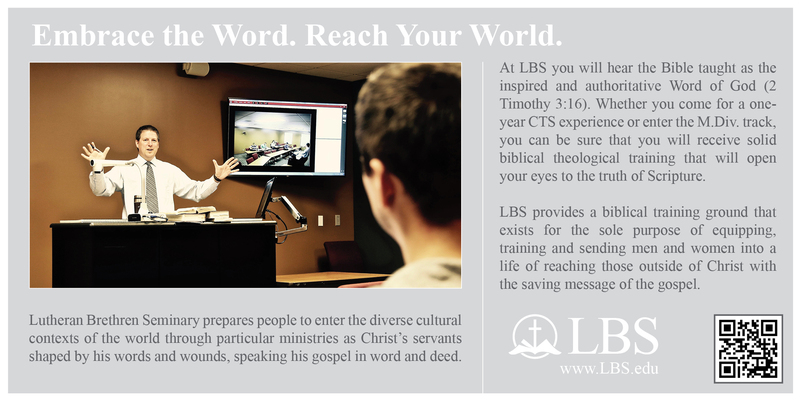 Brad Pribbenow is Professor of Old Testament at Lutheran Brethren Seminary.